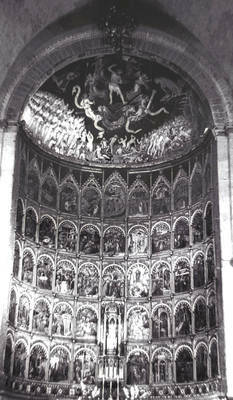 Interior apse (St. Martin or Oil Chapel), which is the central radiating chapel, with 15th century reredoes with 54 scenes of the Life of Christ and the Virgin Mary by several painters with Dello Delli as the Master. Nicolas Florentino (Nicholas of Florence) painted the dramatic Last Judgment fresco, with Jesus directing condemned souls into the jaws of hell. At the center is a depiction of Salamanca's patron saint, the Virgin of the Vega.